But, wait. Do people still read it? Perhaps that’s why the Old Farmer’s Almanac, the oldest continuously published periodical in the United States, is still able to make news with its weather predictions. For what it’s worth, the Almanac predicts a harsh, bitterly cold and snowy winter this year. 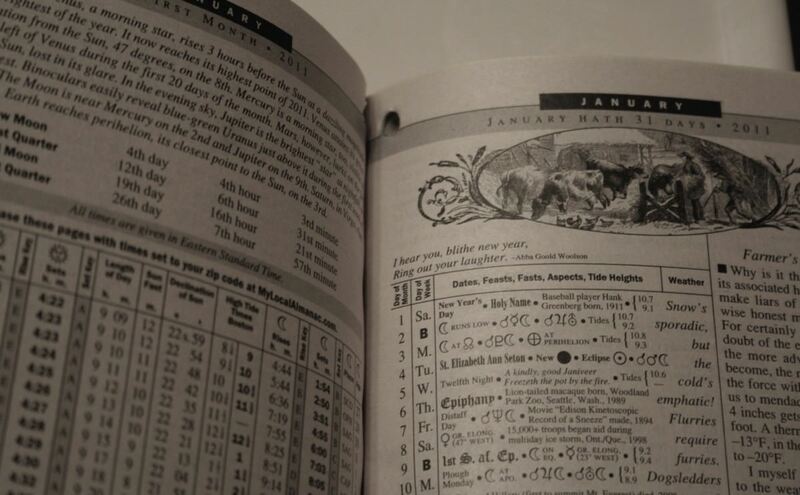 Founded in 1792, the Old Farmer’s Almanac is a strange, quirky publication published annually. (It’s also changed its name a few times from the Farmer’s Almanac to the Old Farmer’s Almanac, though there is another, similar publication currently called the Farmer’s Almanac. It’s all very confusing.) The publication is mostly made up of long-range weather forecasts, guides to specific days ideal for planting, astronomical and astrological data, recipes, and various agriculture-related articles. Over the years, we have refined and enhanced that formula with state-of-the-art technology and modern scientific calculations. We employ three scientific disciplines to make our long-range predictions: solar science, the study of sunspots and other solar activity; climatology, the study of prevailing weather patterns; and meteorology, the study of the atmosphere. We predict weather trends and events by comparing solar patterns and historical weather conditions with current solar activity. It’s worth noting that studying sunspots is not an accepted method of weather prediction; only the Almanac seems to think this is a valuable bit of data. And its predictions are not fantastically accurate; a 1981 study from John E. Walsh and David Allen found that the Old Farmer’s Almanac predicted deviations from the average with barely over 50 percent accuracy. Not bad! But also, like, not great. The Almanac also predicted “global cooling” back in 2009. Most farmers don’t rely on the Almanac anymore, not with all the fantastically advanced technology out there these days – and especially since farming continues to be a cutthroat business of razor-thin margins. But that doesn’t mean they don’t read it; it’s an entertaining, funny, and ballsy publication. After all, people still turn out to Punxsutawney, Pennsylvania, each year to see if the groundhog predicts six more weeks of winter.